Fiddes Hard Wax Oil - Goosebay Sawmill and Lumber, Inc.
Fiddes Hard Wax Oil is a unique coating that has exceptional durability combined with a satin, natural appearance. It is suitable for floors, fine furniture, cabinetry and kitchen work surfaces. Its recoating ability is similar to Clear Glaze varnish in that there will be good bonding between coats whether the finish is relatively fresh or years old. Hard Wax Oil can be easily spot repaired by simply wiping or brushing a thin coat over a worn area. We do not recommend Hard Wax Oil for use on items such as salad bowls, cutting boards, or wooden food utensils. 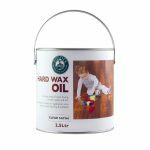 Hard Wax Oil is suitable for application onto children’s toys – it bears EN 71-Toy Safety Certification. Thinning: No Thinning is generally necessary or desired, but White Spirit can be used minimally. Note: It is often asked if Hard Wax Oil can be used over or under other finishes. Although Hard Wax Oil has good adhesion to many other coatings, it is recommended that it be used as a “single pack” coating and best used by itself from start to finish on raw wood.